Hi, a little canvassing of opinion here. Where you have obviously thin bits of opal you think are still very attractive, you can make a doublet out of them. Fine. 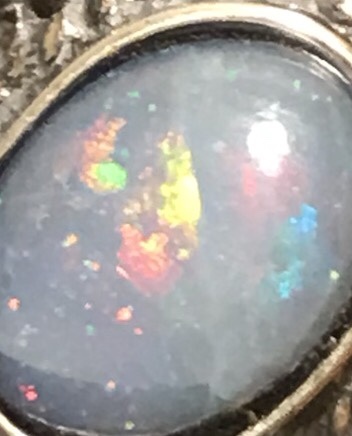 Where you have a crystal opal that is thicker, say 2-3 mm, that could stand on it's own, are you tempted to make a doublet with a black base to bring out the colour, leave it 'as is', or is there a third option of just colouring the back of the stone dark? Doublets must be declared as such, which is as it should be. What is the accepted norm in the industry of colouring the back of a stone? Again, it would be declared as such, but what does it do to the value of the stone? A solid crystal opal, vibrant colours with a dark ink / pigment on the back or the same opal without the ink / pigment; how would you value such stones? A naturally dark crystal of the same vibrancy would likely be more expensive but if a transparent crystal could be offered with a black back, would that detract from the value of offering it with no black back. I suppose what I'm asking is will you depreciate the value of the crystal opal if you make the back black rather than add a traditional doublet back? Or would you leave the option of the coloured back to the stone setter?! It should still be considered a treatment. But, when you have an opal that is either too thin or just a bit boring a backing may save the day. You take an opal that may not have much value and is hard to sell and turn it into a pretty opal that will sell quickly. There is nothing wrong with a pretty doublet. Take the high road and keep a good reputation as an honest lapidary and you will be rewarded by happy and repeat customers. A solid opal will always be more expensive than a doublet with equal quality opal. If you are going to sell the opal, leave it as is, but show it on a black backing so customers can see the color pop. Leave it up to them on whether they want to blacken the back. It is also very easy to blacken the inside of a bezel setting in order to get the same effect. There is one other option that works okay for some crystal opals. Sometimes a matte finish on the back side will let the colorplay show better from the face. If you have a thicker one that's already polished on the back just rough it up a little on a well broken-in 220. From there you can go to 280 or 600 or whatever gives you an appearance you like. If the colorplay shows up well enough to suit you then you don't have to deal with the disclosure issue. In my opinion, You will retain more value with a traditional doublet backing. I typically use a thin piece of jet. Nice looking doublet. We've done the same thing with black opal potch if we have it, or with basanite. Have even painted backs with colored (black) epoxy to get that same effect. That's a great way to make a relatively unimpressive opal look lots better. As for valuation, doublets and triplets have always sold for a fraction of a solid opal of the same quality. A good doublet can command a nice price, for sure, so if the colorplay doesn't show well enough with the matte back you might as well go for it and make it a doublet. The matte back does work for some stones, but if it doesn't you already have a good surface for the epoxy to bond to. i wont make doublets or triplets. im not into using artificial ways to enhance a stone. I've attached a photo of the crystal (taken in artificial light). One on black, other plain wood. Some may find it a little boring with just the one colour but I quite like it! It's transparent (you can read text if you place it over writing) and the color is there without the black background, black just makes it pop a little and it would make a finished stone of about 3mm depth without a backing. If you are setting the stone, I like the idea of using a solid-back setting in which you can blacken the back, leaving the opal alone. As has been said, a solid opal is going to fetch a higher price than a doublet. Some transparent opals with bright fire look fine as-is. I have some that I enjoy both the transparency when held up against the light and the opalescent play of color and would only set those in an open back. Depends on the opal. Some opals simply wouldn't be usable for jewelry unless they were backed and/or capped. There are also natural doublets, too (opal on background matrix) which somehow do fetch higher prices than man-made doublets. Nothing wrong with doublets or triplets (they can look amazing), so long as the customer is informed - particularly on the internet where folks are going mostly by photos. I've attached a photo of the crystal (taken in artificial light). One on black, other plain wood. There is a dramatic difference in the two photos but much of that difference is due to the contrast of the large areas of background around the stone. A more accurate evaluation could be made if you only use the two backgrounds under the stone itself and photograph both on a neutral gray background. That way the camera would be more likely have equivalent settings. Jerry that is very true about the back ground color. on my web site i use gray wet towel, In Oregon lighting now. Spencer Mt. opal very thin lap to color. Why so many doublets are out their. Kelvin, is the heat index, that the Cones & Rods in your eyes see as color. same for your camera photo deck to chip. Refractive light index is the color we see, being reflected back out. rutilated quartz I use silver backing, or just leather for padding. As too what Jerry said, use different colors in sun light an / Long & short wave UV lighting with gray back ground. UV is to so you the depth of the stone in the dark. Or use laser glasses an a laser to look for flaws in the material before cutting. flaws dispense lasers light to so the flaws. Conman trade use in selling many stones. Soaking them in WARM HONEY to hind flaws!... Air dry rug off. I like the idea of sitting it on a black / neutral coloured opal sized base and photographing on a neutral surround...I will give that a try. Many thanks for everyone’s thoughts on this, really appreciate it! I'm curious what kind of lighting you used for this? I have to admit I get very confused about what an opal looks like in the real world, vs. the photo world. On the one hand, your eyes in person see far more fire than the camera does in regular lighting, and on the other, the various kinds of artificial light give a weird glow that also makes it hard for me to tell what the actual stone looks like and may imply greater fire than exists.